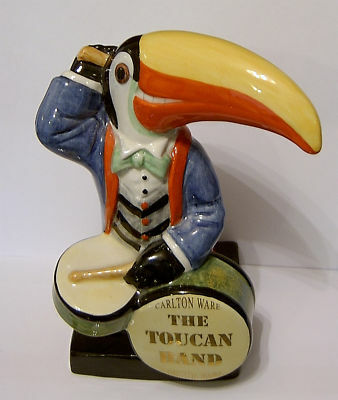 At last we have a small series of the very popular Toucan Band Member. Unfortunately, there are only two such members from Carlton Ware, as all other moulds were destroyed some years ago. This one is the large Toucan Drummer (1) in a distinctive colourway. He is wearing a blue jacket with red lapels, red trousers and a light green bowtie. His waistcoat is grey and black V stripes with red buttons. The lower part of his beak is red and he sports a rather sly grin. He stands 7.25 inches (18.5 cms) tall and is set on a black plinth.